This EPA approved broad range sanitizer delivers correct sanitizing at a range of 150-400 ppm, allowing the sanitizing solution to adapt to varying water pressure situations while maintaining compliance with health department regulations. Multi-Range Sanibet Kills 99.99% of food service organisms-Listeria, E-Coli, and Salmonella. A versatile product, it can be used to sanitize serving ware, utensils, pots & pans, and food processing equipment. It can also be used for disinfecting floors and walls. It is a complete, chemically balanced disinfectant, sanitizer that is effective even in the presence of hard water. Highly concentrated, this product provides a low end use cost per gallon. Multi-Range Sanibet has a red color indicator which provides visual confirmation of use. For School, Restaurant, Food Handling and Processing Areas, Bar and Institutional Kitchen Use. This product kills 99.99% of Foodservice Germs E. coli, Salmonella, and Listeria. This product is an effective sanitizer at 200 ppm active quat for use on food contact surfaces in 500 ppm hard water against: Campylobacter jejuni, (Community Associated) Methicillin-Resistant Staphylococcus aureus, Escherichia coli, Escherichia coli 0157:H7, Klebsiella pneumoniae, Listeria monocytogenes, Salmonella enterica, Shigella sonneii, Staphylococcus aureus, Staphylococcus aureus Methicillin-Resistant - MRSA, Yersinia enterocolitica and Vibrio cholerae. Add 3 oz. of this product per 5 gallons of water to disinfect hard, nonporous surfaces. Before use in federally inspected meat and poultry food processing plants and dairies, food products and packaging materials must be removed from the room or carefully protected. When used on surfaces in areas such as locker rooms, dressing rooms, shower and bath areas and exercise facilities, this product is an effective fungicide against Trichophyton mentagrophytes the athlete's foot fungus. Apply use-solution with a cloth, mop, sponge, sprayer or by immersion, thoroughly wetting surfaces. For sprayer applications, use a coarse spray device. Spray 6 - 8 inches from surface; rub with brush, sponge or cloth. Do not breathe spray. Note: For spray applications, cover or remove all food products. Treated surfaces must remain wet for 10 minutes. Wipe dry with a clean cloth, sponge or mop or allow to air dry. Rinse food contact surfaces such as counter tops, tables, picnic tables, exteriors of appliances and / or stove tops with potable water prior to reuse. Do not use on glasses, dishes or utensils as a disinfectant. For heavily soiled areas, preclean first. Prepare a fresh solution daily or more often if the use solution becomes visibly diluted or soiled. 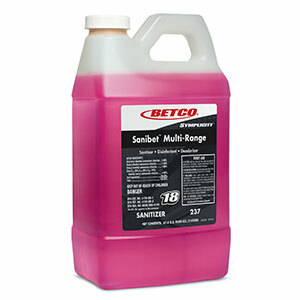 For Use on Finished Floors: To limit gloss reduction use this product at 3 oz. per 5 gallons of water. Apply with a damp mop or autoscrubber. For sanitizing hard non-porous surfaces of food processing equipment, dairy equipment, food utensils, dishes, silverware, glasses, sink tops, countertops, refrigerated storage and display equipment and other hard nonporous surfaces. Prior to application, remove gross food particles and soil by a pre-flush, or pre-scrape and, when necessary, pre-soak. Then thoroughly wash or flush objects with a good detergent or compatible cleaner, followed by a potable water rinse before application of the sanitizing solution. Articles too large for immersing, apply a use-solution of 1 oz. of this product per 5 - 2 gallons of water (150 - 400 ppm active quat) to precleaned hard surfaces thoroughly wetting surfaces with a cloth, mop, sponge, or coarse sprayer. Surfaces must remain wet for at least 60 seconds followed by adequate draining and air drying. Do not rinse. Immerse pre-cleaned glassware, dishes, silverware, cooking utensils and other similar size food processing equipment in a solution of 1 oz. of this product per 5 - 2 gallons of water (150 - 400 ppm active quat) for at least 60 seconds. Drain thoroughly and allow to air dry before reuse. Do not rinse. Prepare fresh sanitizing solution daily or more often if the use solution becomes diluted or soiled. For mechanical applications, use-solution may not be reused for sanitizing applications but may be reused for other purposes such as cleaning. Apply to sink tops, counter tops, refrigerated storage and display equipment and other stationary surfaces by cloth, sponge, brush or coarse spray. 1. Scrape, flush, or presoak articles (whether mobile or stationary) to remove gross food particles and soil. 2. Thoroughly wash articles with an appropriate detergent or cleaner. 3. Rinse articles thoroughly with potable water. 4. Sanitize by immersing articles with a use-solution of 1 oz. of this product per 5 - 2 gallons of water (150 - 400 ppm active quat) for at least 60 seconds. Articles too large for immersing must be thoroughly wetted by rinsing, spraying, or swabbing. 5. Remove immersed items from solution to drain [and then air dry]. Non-immersed items must be allowed to air dry. Do not rinse. Equipment and utensils must be thoroughly pre-flushed or pre-scraped and when necessary, pre-soaked to remove gross food particles and soil. 1. Thoroughly wash equipment and utensils in hot detergent solution. 2. Rinse utensils and equipment thoroughly with potable water. 3. Sanitize equipment and utensils by immersion in a use solution of 1 oz. of this product per 5 - 2 gallons of water (150 - 400 ppm active quat) for at least 60 seconds at a temperature of 75°F. 4. For equipment and utensils too large to sanitize by immersion, apply a use-solution of 1 oz. of this product per 5 - 2 gallons of water (150 - 400 ppm active quat) by rinsing, spraying or swabbing until thoroughly wet. 5. Allow sanitized surface to drain [and air dry]. Do not rinse. 1) Scrape and pre-wash utensils and glasses whenever possible. 2) Wash with a good detergent or compatible cleaner. 3) Rinse with potable water. or for contact time specified by governing sanitary codes. 5) Place sanitized utensils on a rack or drain board (to air-dry). 6) Prepare a fresh sanitizing solution at least daily or when visibly soiled or diluted.